Coach Concepts was established in 2004 to fill a niche market for discerning coach operators. We pride ourselves on producing an excellent product built to suit Australian conditions. Our reliability and our can-do attitude to delivery is what sets us apart and our main priority is to provide sophisticated vehicles for our valued customers. Here at Coach Concepts we are dedicated in providing the best quality Australian built vehicles. We have proven reliability not only in our product but also in our high level of service and communication with our clients. We are a very productive team that wants to build the best and most exclusive buses and coaches for our highly individual clients. While we started out building luxury coaches for our longstanding clients, in 2015, due to huge demand, we began production of the Coach Concepts bus. 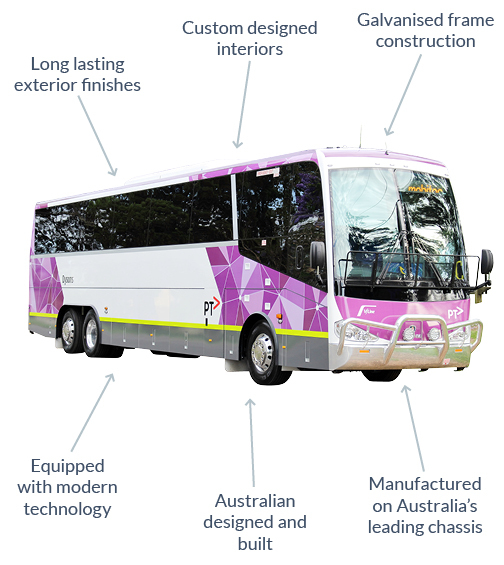 This vehicle meets all Australian bus contract requirements and provides the functionality of a bus in the body of a coach. These buses will add stylish lines to any bus fleet but maintains the longevity of an Australian built vehicle. All Content is copyright 2017 © Coach Concepts. All rights reserved.